My son Jackson is a super-smart kid with a big heart. He’s now in fourth grade and reading at near a high school level. He loves superheroes and cartoons, and he’s extremely picky about food. It was only recently that he received an official diagnosis of autism. Now that I know more about autism, I can look back and see that he displayed some classic behavior. He had intense phobias of elevators and automatic toilets. He also had the habit of twisting his fingers in the air and making certain repetitive noises. It was kind of a routine he went through that he called his “sound effects.” The diagnosis now makes sense, but honestly, when he was younger I just thought he was a quirky kid. It was when he started kindergarten and began to have trouble socializing that we considered counseling. His difficulty, we thought, came from the medical treatment his older brother, Wesley, was going through. That was the year that Wesley began complaining of headaches and lost energy. 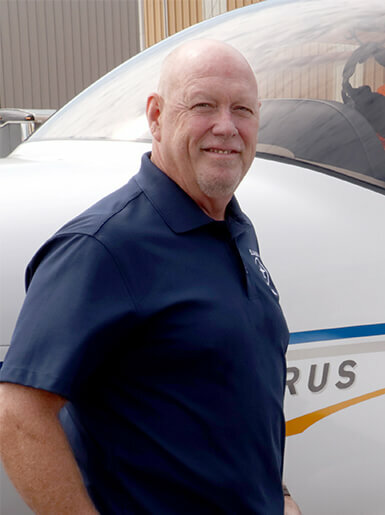 I took him to the ER, and a little over 24 hours later he was diagnosed with a rare, fast-growing cancer in his jawline, esophagus and sinuses. Jackson adores his big brother; he is his hero and his best friend. So, just as Jackson was starting school, suddenly his big brother wasn’t on the bus anymore. 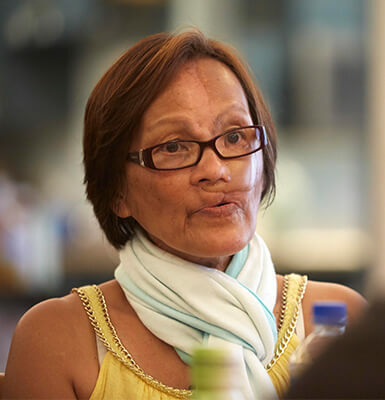 I had to practically live at the hospital for weeks while Wesley was going through chemotherapy. Jackson would sometimes come with me and read books to his older brother. As soon as Wesley’s chemo ended, we felt he could use some therapy to help heal emotionally as well as physically. I started thinking maybe Jackson could use some counseling because he had a hard time understanding what his brother was going through. That is what led to Jackson being diagnosed with high-functioning autism. So, we got slammed with the cancer and then had to understand what the autism diagnosis meant for Jackson. The hand waving and noises, we learned are called “stimming,” which is short for self-stimulation. They are basically ways that Jackson calms himself. He’s happy when he’s doing them, and we’ve just kind of gotten used to them. 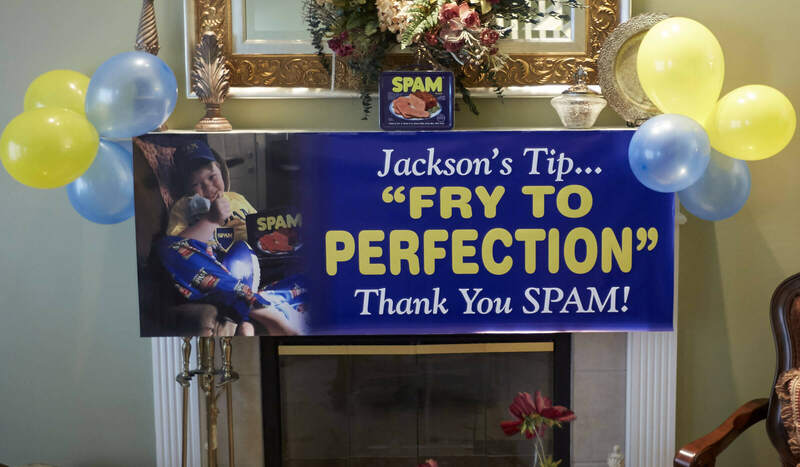 Jackson is also very particular about what food he’ll eat, and new foods often make him gag. He’ll only eat certain foods and will only go to certain restaurants. Smells, textures and tastes have to be really predictable and consistent. Once, he found a hard crumb on a chicken nugget, and he was done with those. He hardly eats any meat products whatsoever, except for SPAM®. 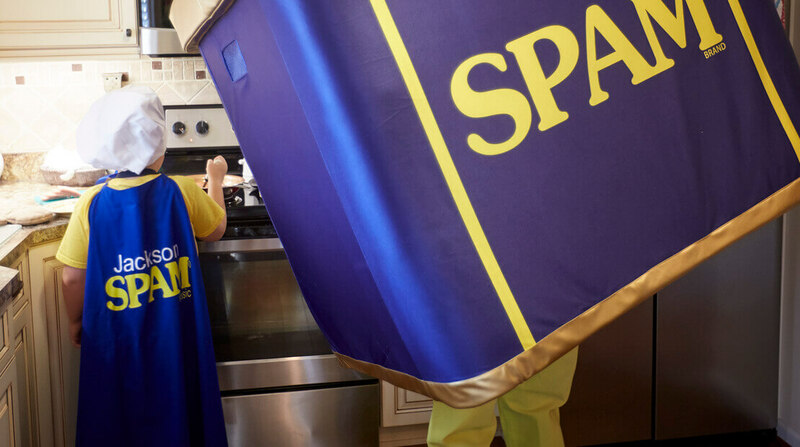 It’s pretty amazing how much he loves SPAM® — and it has to be the classic variety. 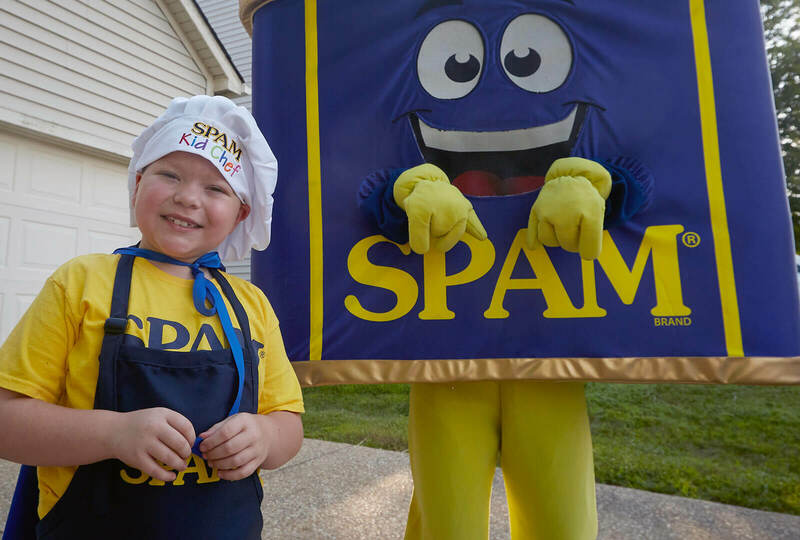 He hardly eats any meat products whatsoever, except for SPAM® products. 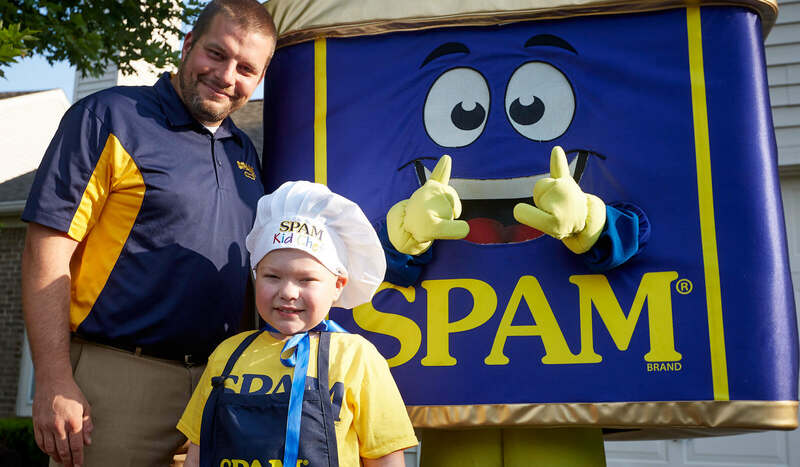 It’s pretty amazing how much he loves SPAM® — and it has to be the classic variety. 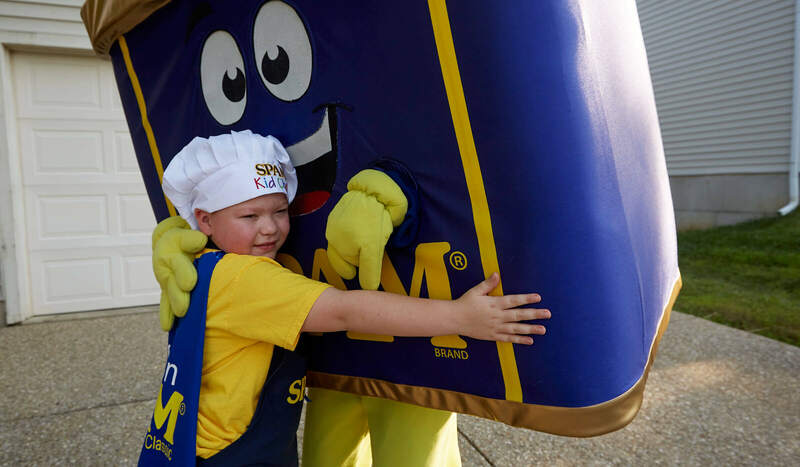 He got super excited last Christmas when his stocking was stuffed with SPAM® classic. Jackson likes to cook it himself, in slices with a little oil in the pan. He knows just the level of browning he likes. It’s his superhero food, and we both depend on it. 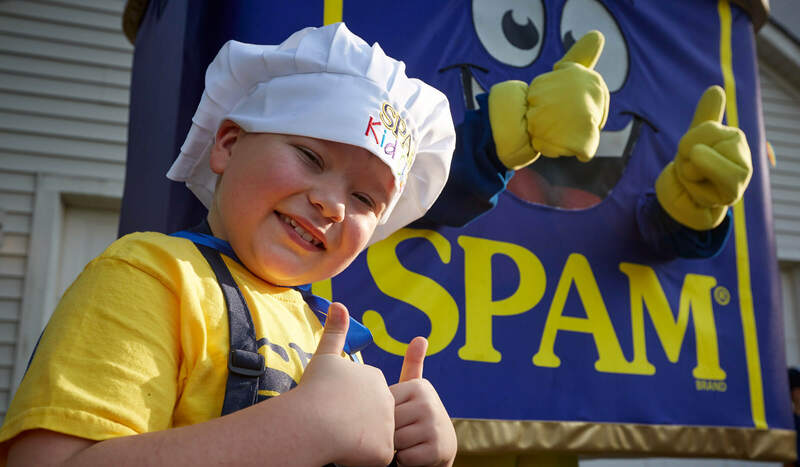 When I wrote to Hormel Foods to say how much Jackson loved SPAM® products, we were overwhelmed at the response. A group of people from the company even came to visit us. 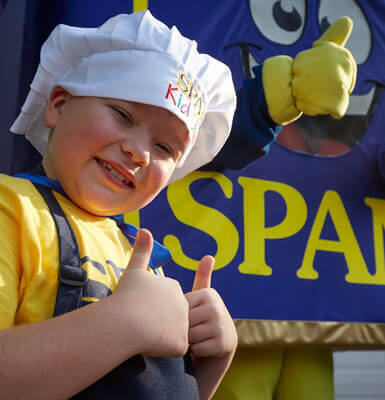 Jackson particularly liked the SPAM® mascot. He just hugged him forever. I’m glad other people are going to get to know Jackson a little bit, and I think the attention helps him realize just how special he is. We’ve received such wonderful support from our friends and community over these years. Members of our church have been particularly caring, and the Louisville Kids Cancer Alliance was remarkable with both Wesley and Jackson. My husband and I say, “We’ve gone through some dark, dark moments and some bad times, but look how many blessings have come out of it.” I wish everybody could experience the kindnesses and blessings we have received. Wesley is now doing great, although there are lasting effects of the chemotherapy that he’ll have to handle throughout his life. As for Jackson, I wouldn’t change anything about him, not for the whole world. His autism is part of what makes him the child we love. I’m constantly amazed with his memory ability. The other day we discovered that he can easily spell words backward. He becomes completely obsessed with subjects to the point where he learns everything about them. He’s taught me about planets and robots. I also know more than I ever thought I would about Sonic the Hedgehog. We now talk about his autism as his superpower. We now talk about his autism as his super power. Both of my children have been my greatest teachers. I still have so much to learn. I can only hope and pray that they continue to see the world as they do now. Jackson is such a tenderhearted kid. To the people he loves he’ll say things like, “You are the ketchup to my fries,” and “Spending time with you is better than going to Disney World.” When I ask him to do something, he says, “Anything for you, my beautiful mother.” He can be a pretty smooth talker! Jackson has big plans for his future. He tells me he’ll get married, have children, become a baker and open his own restaurant. 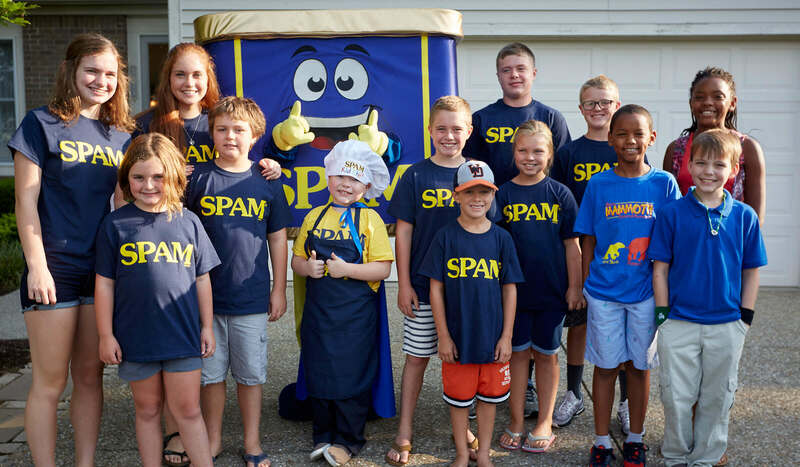 Of course, the specialty dish on the menu will be SPAM® and fries. “The two best foods in the world,” he says.